One of the best cards in the deck, the Key card gives you the power to unlock mysteries, your destiny, freedom, and more. It represents answers, success, revelations, and dreams coming true. The Key can indicate important events, significant encounters, and influential people. Where the Lenormand Moon indicates psychic abilities and the dropping of the veil between this realm and the mystical realm, the Key shows higher spiritual and karmic connections. It allows you to access life's mysteries and gives you the opportunity to achieve your ambitions. The Key also differs from the Cross (which involves religious beliefs) and the Tree (which includes spiritual health). In a Grand Tableau, the closer the Key is to your card (Man/Woman), the more power and success are in your control. 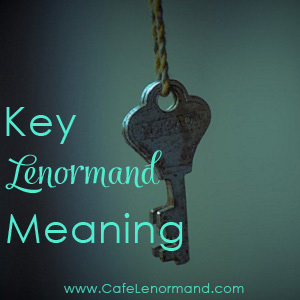 The Lenormand Key Meaning in Love: The Key card indicates an important relationship. There could be a soul connection or a karmic connection. If there are any issues, they should be able to be resolved. The Lenormand Key Meaning for Career: The Key refers to an important career path, important discoveries, or control over your career. The Lenormand Key Meaning in Health: The Key card means you should have a successful recovery. Everything should turn out fine. Using the Key for Timing: The Key means now. It's about immediacy – the present. How can you be more trusting that everything is working out? How can you better connect with your higher self, guides, angels, God, Source, the Universe? What opportunities are presenting themselves? This is a good time to take a chance.